Historic New England (formerly SPNEA) works to preserve notable buildings and other monuments of New England's rich architectural history. Formerly the Society for the Preservation of New England Antiquities (SPNEA), Historic New England owns and maintains 32 historic houses, estates and farms in Connecticut, Maine, Massachusetts, New Hampshire and Rhode Island, including Beauport, the Sleeper-McCann mansion in Gloucester MA, and Castle Tucker in Wiscasset ME. If you have any interest in domestic architecture, interior decoration and domestic life (particularly of the wealthy) in cities, towns and the countryside during the late 18th and 19th centuries in New England, you will want to visit several of Historic New England's properties. 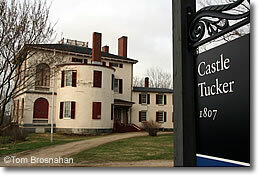 Castle Tucker in Wiscasset ME.